"We are trying to shorten the schedule for the future generations "
1 - Rosi: Dear Rafa, in its own right, you had the honor of being the first to walk on the pristine grass of Centre Court of the All England Club, something that moved me deeply ... I would be thrilled for you to tell me what you felt. Good luck and a big hug from Madrid ..
2. Valerio Fernandez: Hola Rafa: As always you are worried about the length of the season and you've already won almost everything, could not you ask yourself after the U.S. Open to finish the season and not come back until Australia? I guess you have obligations, but there will be ways to circumvent them. I think Borg rested four months a year. Rafa: In the Grand Slams we choose our hotels. At Wimbledon, what happens is that we are far from the city and it rains a lot, making it more comfortable for us to stay here close to the tournament. If you could imagine a day like yesterday where it rained so much. You have to stay all day at the club and for a long time without doing anything. This way we go home, rest, eat and prepare better. Perhaps in other Grand Slam tournaments is not as convenient upon organized differently. 4. Eloy Salamanca: Hola great champion. I wanted to know if winning in Paris, allows you to play more relaxed because, as Toni Nadal said , with Paris you have saved the season. Oh, another thing, what I can fish in the area of Cala Pi?. I'll be there this summer. See you soon champ. Rafa: Yes, , I think it is better and I come with confidence. For fishing, with cane or in the sea? At the end it's the same as you can fish in Porto Cristo. The same Mediterranean, clearly. For example, maidens. 5. Marga García Martínez: How do you feel when a child approaches you with his face lit up and asks for an autograph? Thank machine. Rafa: The truth is that it's nice to see the faces of people and especially children. It's very nice, really. 6. Rym Fathallah. Souissi: Hola Rafa, can you imagine what Federer's career would have been without your appearance in his life and ours? Thanks for being you, Greetings from Tunisia. Rafa: Tennis is like this and every era has its players. Federer is the best I've ever seen. I believe, and I've always said that Federer, being there has made me a better player because I was always forced to play better. Rafa: My Foundation did a punctual thing with the Foundation of Vicente Ferrer there in India but the main focus of activity is in Spain. 8. Cristina Fernandez de Castro Gonzalez: Rafa, I first I want to wish you the best in the GS. Today I found myself reviewing videos with an interview you did in 2002, where they were praising the promises of tennis in Manacor. What happened to them? Or rather, what might be circumstances that prevent these promises to make it? Rafa: Yes, I remember that moment. One thing I always that my uncle said after juniors European Championship was to look at all names of the players who had won that at my age. The message is that further fighting and learning because they had not gotten anything yet. Tennis is a very competitive sport and you have to keep learning forever. It is constantly evolving. In the end, everything depends on many circumstances but of course in tennis all depends on you and that's nice to have this sport. 9. Belén Gómez Pérez: Hola Rafa, congratulations first of all for how you are playing, for what you are and what you have achieved. 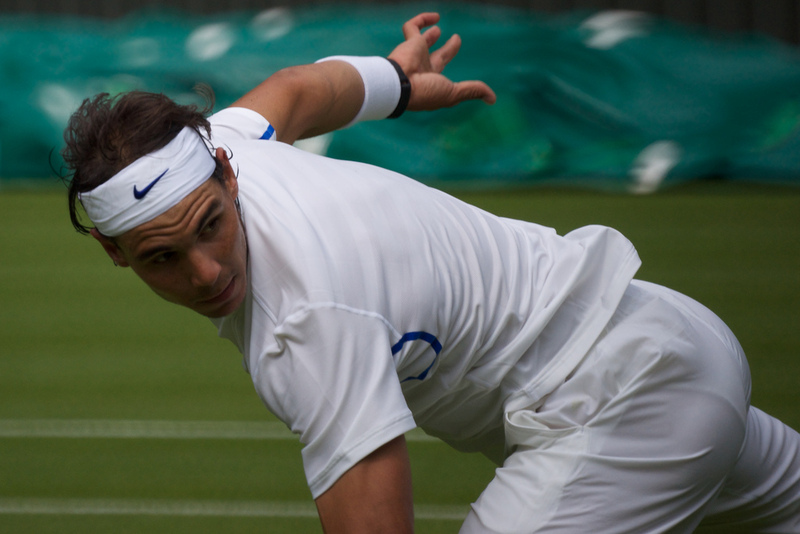 Do you think that being a left-hander has benefited you as a tennis player throughout your career? Rafa: I do not know, maybe in few things... but well, Federer and Djokovic are right handers... and the majority. Rafa: The first is that the ball is much faster and lower to what needs to change is the strokes. Also, the strategy is different because the points are much faster. In short, many things.